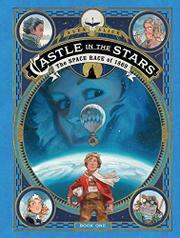 Some people will love this fanciful tale of a 19th-century space race so much they never finish it. This graphic novel is filled with distractions. Every scene has a new detail to focus on, usually off in the corner of a panel: a watercraft decorated with golden cherubs or an airship shaped like a swan. When one character holds up a book of blueprints (for a craft that travels “through aether”), readers may be tempted to crane their necks to get a better view of the tiny drawings. The artwork, which combines loose pencil outlines with elaborate watercolors, is that spectacular. Many panels could be framed as paintings, and it would be easy to ignore the text and just stare at the pictures of cloud banks. But that would be a mistake, as it’s a terrific adventure story with disguises and air chases and a plot against Bavarian royalty in the late 1800s. The story is full of digressions, though, and the digressions are the best part, as when the main character (a schoolboy named Seraphin) explains why there must be dinosaurs on Venus. In another, the royal architect shows off the orchestra pit on an airship. This is bad science and bad history (and surely not everyone in Bavaria was white), which makes it fantastic steampunk.